A Turkish private plane carrying 11 people has crashed in Iran while flying the daughter of a prominent businessman back from her hen party, Turkish media report. Turkish officials said eight passengers and three crew were on board. 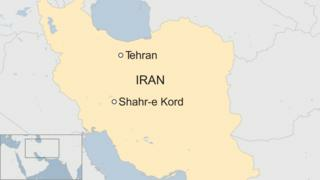 All are feared dead after the jet burst into flames on a mountainside near the city of Shahr-e Kord, in western Iran. Turkey’s Hurriyet news outlet said the passengers were 28-year-old heiress Mina Basaran and seven of her friends. The group had been celebrating in Dubai ahead of her wedding, scheduled for next month. The Bombardier Challenger 604 plane reportedly belonged to a firm owned by Turkish business tycoon Huseyin Basaran – the bride-to-be’s father. Mr Basaran is a former deputy chairman of Trabzonspor football club, which plays in Turkey’s top football league. He has business interests in the energy, finance, construction, food and tourism sectors, among others. His building projects include a cluster of luxury apartment blocks in Istanbul, named Mina Towers after his daughter. Ms Basaran had become a board member of her father’s company in 2013, Turkish reports said. The young woman posted a picture on Instagram a day ago, which shows her surrounded by smiling friends in sunglasses and dressing gowns. The photograph, hashtagged #minasbachelorette and #bettertogether, said it was taken at the One and Only Royal Mirage luxury hotel in Dubai. The plane is believed to have been en route from the UAE to Istanbul when it came down. Iranian news agency ISNA said on Sunday that emergency crews were attempting to reach the wreckage but were being hampered by the terrain. Locals in the western province of Chahrmahal-Bakhtiyari who had seen the crash site said there appeared to be no survivors, the agency said. Last month, a plane carrying 66 people came down in Iran’s Zagros mountains, which are also in the west of the country. The Aseman Airlines plane, en route from Tehran to the south-western city of Yasuj, crashed near the city of Semirom in Isfahan province.